One of the important needs in a human beings life is the need for SECURITY. Security in a marriage is to have freedom from anxiety and fear. We feel secure in our spouse when we are GUARANTEED that an obligation will be met. Insecurity is the opposite because it is being subject to danger or injury. The devils workplace is to make us feel INSECURE in our spouse. Eve’s whole security was based on God’s word. In Gen.3:4 when the devil said that God was lying to her, a demon of insecurity made her feel insecure. That is the enemy’s specialty to take God’s word and make it out to be a lie. God’s love in our life provides SAFETY. In marriage we unload each other’s baggage into each other’s life. CASE AND POINT: When you travel, everyone has to go through security. Obviously, it is because of terrorism. The tighter the airlines are on security, the better I like it. Years ago I use to see travel bags completely wrapped up in some sort of cling wrap. This was to keep airline employees from stealing things out of their bags. It looked so funny to see suitcases with five layers of cling wrap. 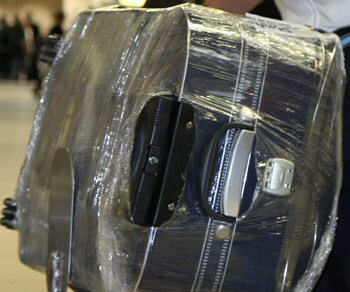 By wrapping their own suitcases, it gave these passengers the security they needed. Do you consider making your spouse feel secure? The word “spoil” means in Hebrew PREY. Prey is a person who is the aim of an attack (especially a victim of ridicule or exploitation) by some hostile person or influence. In other words, the devil is willing and waiting for your spouse to listen to his lies that you will never bring security to their life. Does your spouse feel SAFE with you? What can you do to help your spouse feel the security that he needs? Is there something you can do to build his CONFIDENCE in you? This is your opportunity to wrap all your spouse’s private information in the protective embrace of your love. PROMISE to help your spouse with sensitivity and gentleness. Offer support and listen with love. Some of your spouse’s SECRETS are part of his history and makeup of who he is. Your spouse will know that he is in a place of safety. Do you want your spouse to draw back into himself and be LOST to you? Make it your life’s work to making him feel secure and loved.